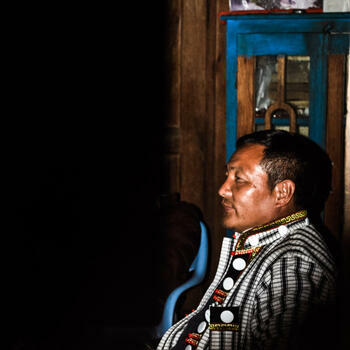 Few outsiders ever used to venture into the northernmost reaches of Myanmar. 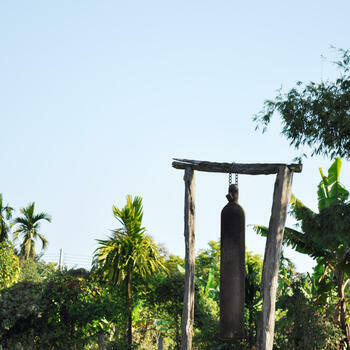 Although the region is reputedly one of the most beguiling and underdeveloped places on earth, it is also traditionally one of the more inaccessible for travelers due to a combination of poor infrastructure and government policy. 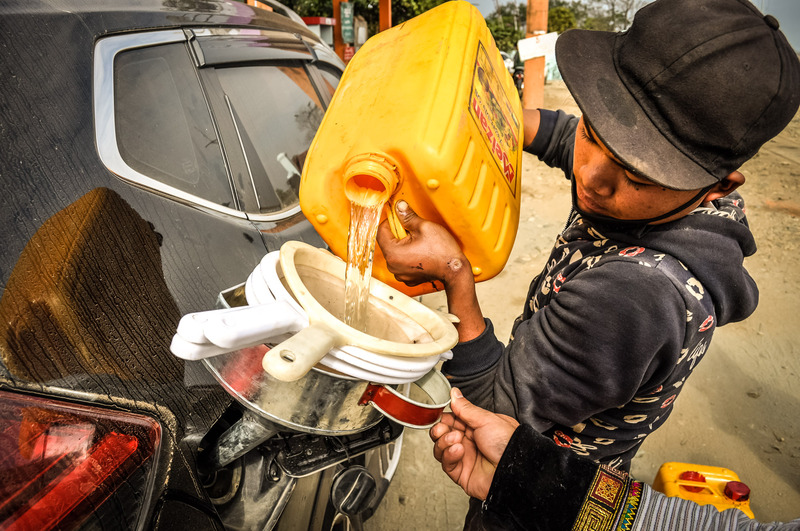 Luckily for us, GoKunming contributor Sun Fei made the overland journey there in January 2018, his travel companions first departing from a remote mountain outpost in China's Yunnan province in January 2018. 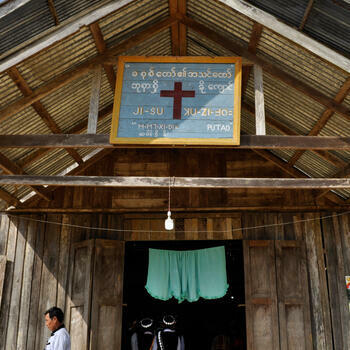 Below is Sun's account of two weeks spent on the road with a religious outreach group of Chinese Lisu people taking cash contributions and other donated items to their brethren in the far north of Myanmar's remote and restive Kachin State. 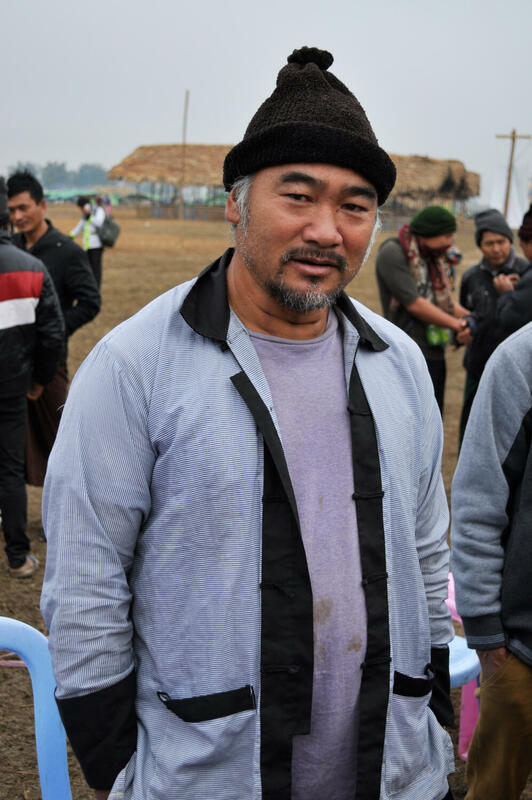 They set out from their village in southwest China in a caravan of three jeeps and one pick-up. 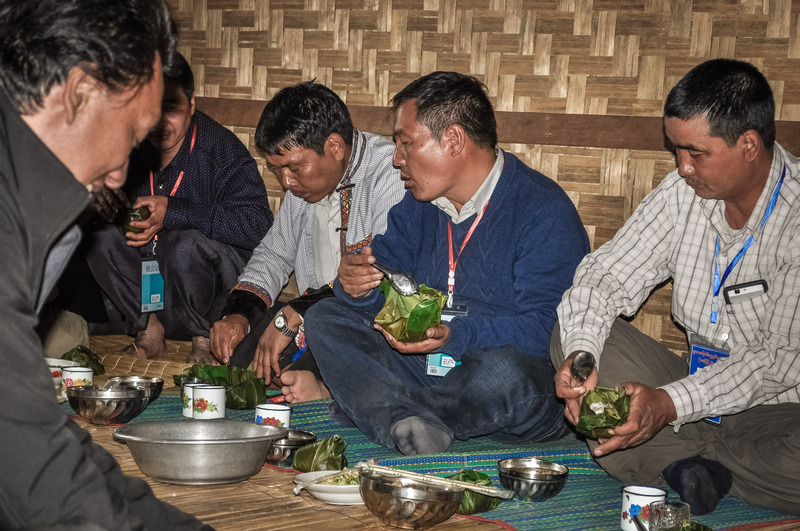 There were a total of 14 people on the trip — all of them from the Lisu indigenous group, and all of them practicing Christians. 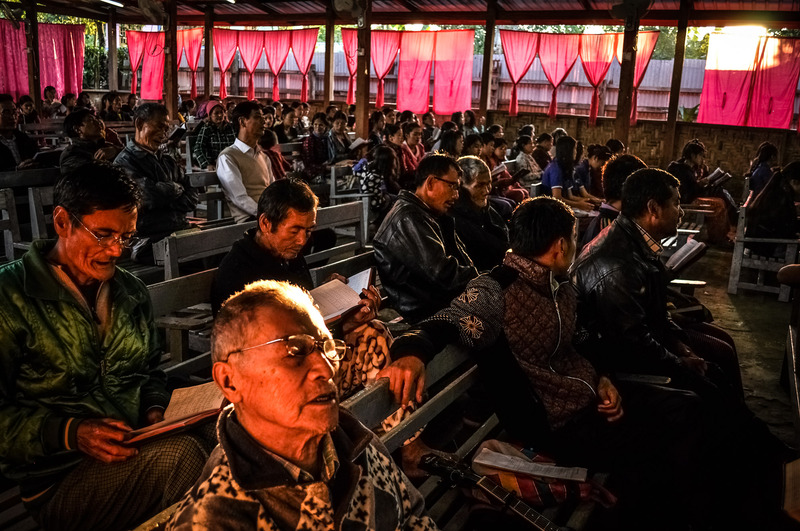 The group first drove south down the Nujiang River Valley, leaving from the town of Gongshan (贡山), and passing endless stretches of dusty road construction along the way. Next it was up and over the Gaoligong Mountains. By the time the group reached Tengchong (腾冲) in far western Yunnan and picked me up, they had already driven nearly 500 kilometers. From Tengchong, the next stop was the border with Myanmar. We spent three hours going through checkpoint after checkpoint — each manned by stern-looking soldiers armed with automatic rifles. 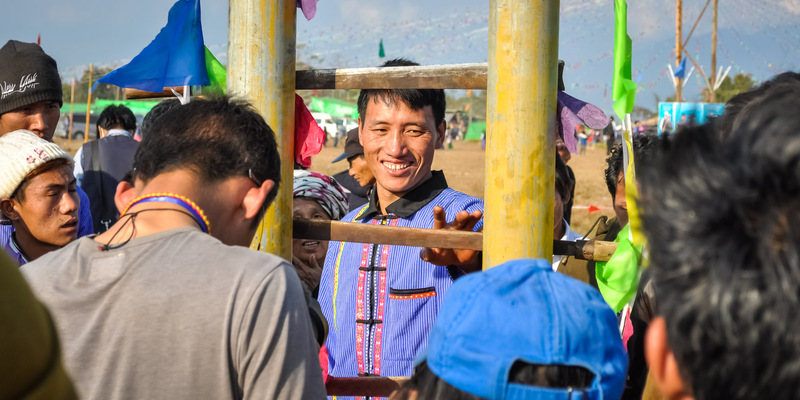 Our purpose for traveling into Myanmar was to meet up with other Lisu people in the remote northern part of the country and hand off charitable donations collected in China. 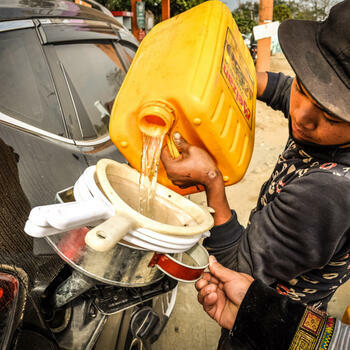 It took our vehicles and belongings a not-so-brisk three hours to clear customs, but then it was back on the road and on our way to Myitkyina, about 140 kilometers away. 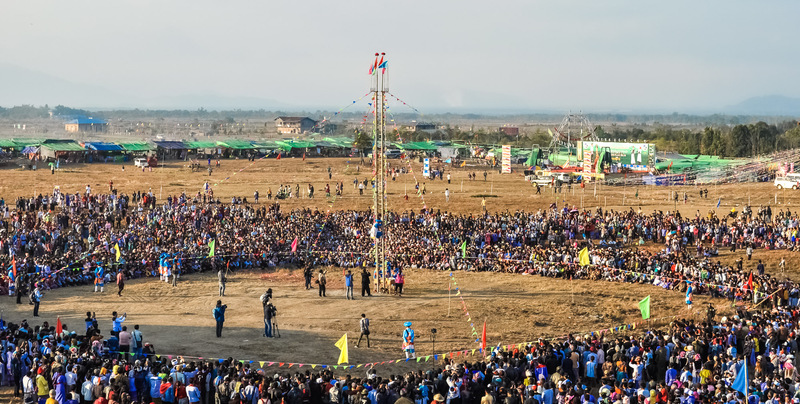 Myitkyina is the capital of Myanmar's Kachin State, and sits on the west bank of the Irrawaddy River. It is also only a few dozen kilometers downstream from the site of the controversial and now-canceled Myitsone Dam project. 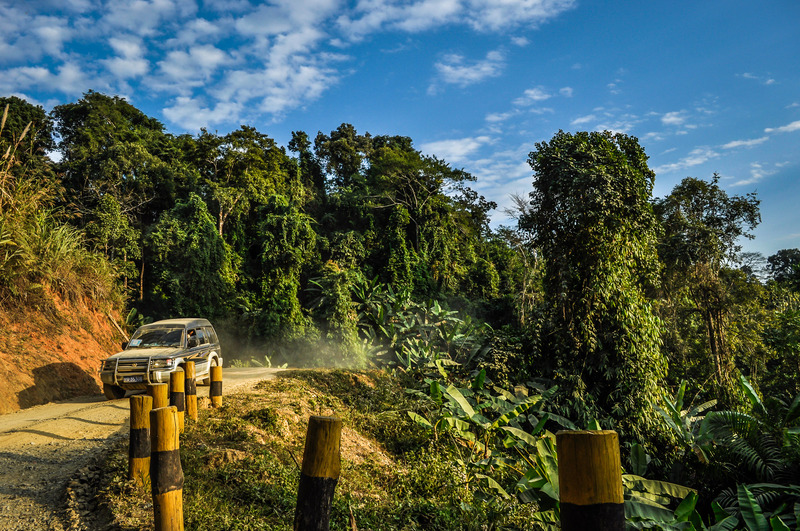 Our trip to Myitkyina from the border was smooth sailing. After a day of dawn-to-dusk driving, we were exhausted. But instead of heading into the middle of town to find lodging, we instead stopped on the outskirts in the small village of Bamendi. 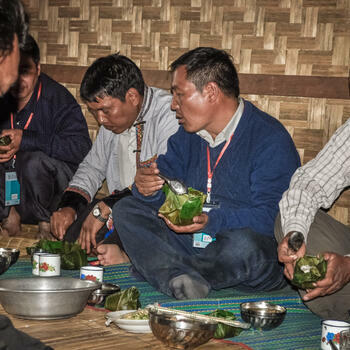 As the sun set, the hospitable locals served a big dinner to their visiting Chinese guests at the local Lisu church. 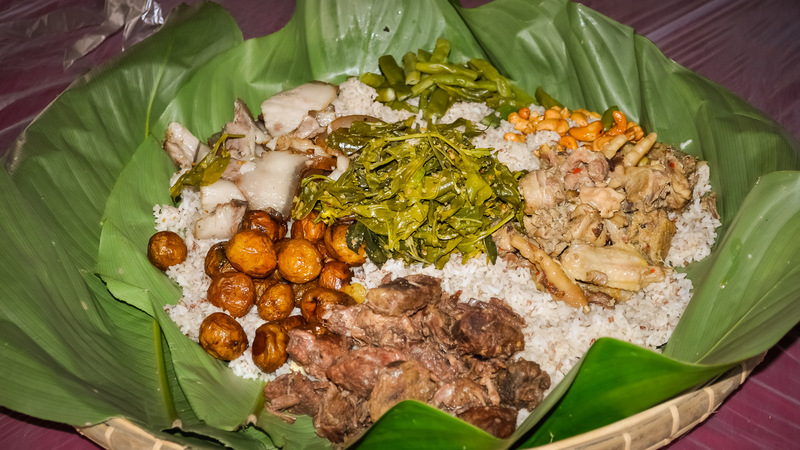 We feasted on game meat and other dishes. Over dinner we learned that the church functions as an education and recreation center for Bamendi. 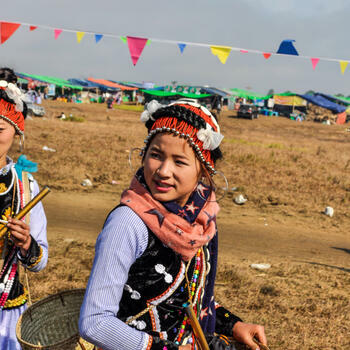 Every day, kids come to study the Lisu written language, others chase each other across open fields while young boys play football with a wicker ball made out of dried bamboo. We watched this scene unfold until the sunshine hid its last golden rays behind the mountains. We rose early the next day to attend mass with our hosts. At 3pm, it was time to get back on the road and head north to Putao. 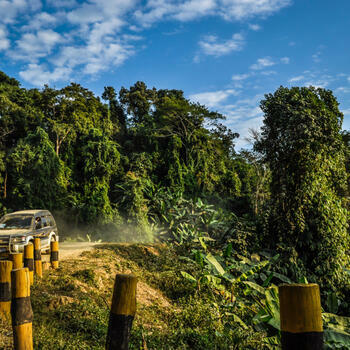 The drive from Myitkyina to Putao is just under 350 kilometers. Except for short stretches leading into and out of each city, the road is entirely dirt. Making things worse is the incessant roadwork along the way. Our caravan of four vehicles sometimes had to swerve precariously to avoid big yellow bulldozers. Thankfully, it was the dry season. Otherwise, monsoon downpours would have caused mudslides all along our route. It took 12 hours, much of it over bumpy and pitted stretches of road. We were often in sight of the Irrawaddy River, and mountains covered with dense jungle surrounded us. The combination of these two views did much to alleviate thoughts of our aching backs. In fact, it was almost like being on some sort of safari. Huge tree ferns bent in the wind, wild bananas bloomed beside the road and vines and creepers thick as ropes extended through the shadows of the canopy. We encountered elephants along the way as well, and the sounds of birdsong and insect chirps were everywhere. Unlike the rugged jungle terrain on our way north, the final approach to Putao was open and flat. Mud and dirt gave way to a straight paved road passing by clusters of bamboo houses on stilts with thatched roofs. Kids stopped to wave as we passed. 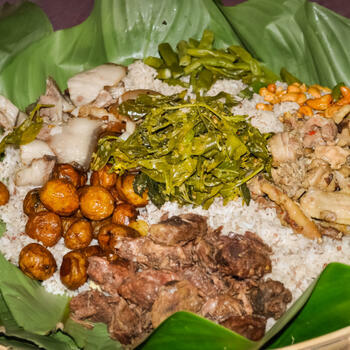 The Lisu name for Putao, we learned, is Gamendi. 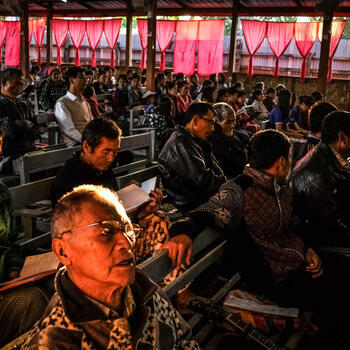 Villagers say that their ancestors chased the sunset through the forested slopes of the Nu River Valley in China, finally catching it on the open plains of Putao before settling down. The point of our trip to Putao was twofold. 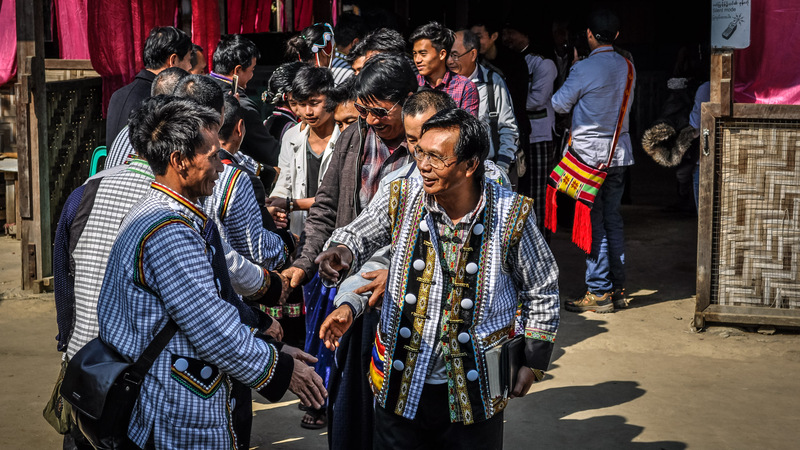 First, we were visiting to deliver goodwill greetings and gifts from the Chinese Lisu members of our group to their distant relatives in Myanmar. 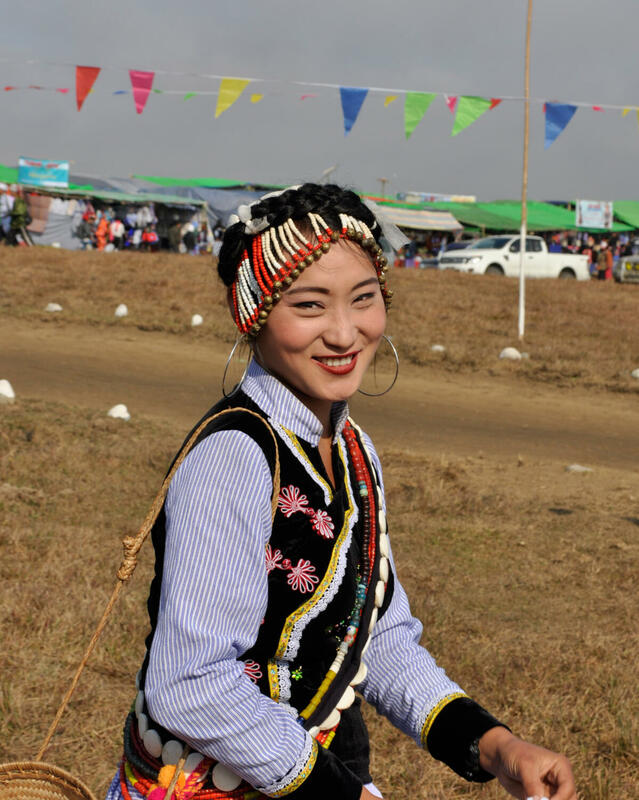 The other was to take part in Kuoshi Festival, one of the largest and most important annual gatherings in Lisu culture. 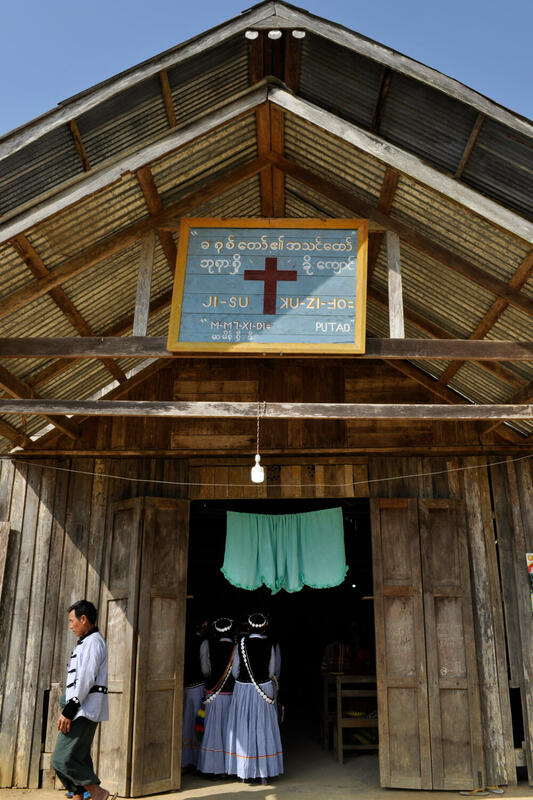 Although upwards of 90 percent of Burmese Lisu are Christian, the festival is a remnant of the days when they practiced a form of animism. In Putao, the space reserved for Kuoshi Festival sat outside of town next to the single runway of the local airfield. Preparations for the event had been intense and costly for the people of this impoverished area. Over the course of two months, villagers made 38 temporary bamboo buildings around the festival ground to house at least some of their expected visitors. They also created reception halls, a public canteen, conference rooms and a dedicated prayer space. The three-day holiday was held this year from January 16 to 18. Thousands of people from abroad streamed into Putao while we were there. Some were from China, while others came from India, Thailand and, of course, from across Myanmar. 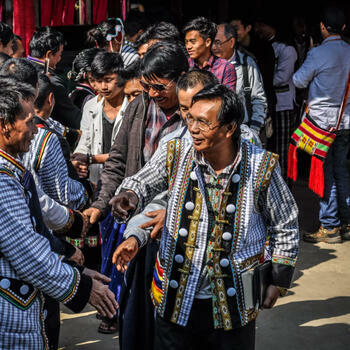 The first day of the event kicked off with all the Lisu dressed in their traditional attire. They lined up before an enormous crossbow statue at the fairground entrance. 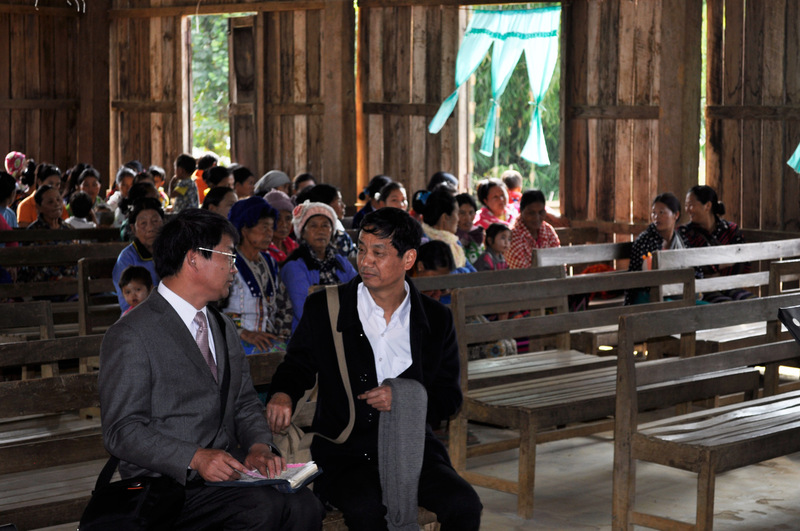 Government officials from Yangon and Myitkyina welcomed their gathered guests before a group of preachers took to the stage for an afternoon and evening of sermons. If the first day of the festival was set aside as a day of worship, the second two emphasized cultural traditions of the more ancient past. The most impressive feats of the day centered around a huge 'sword ladder' raised in the center of the fairground. 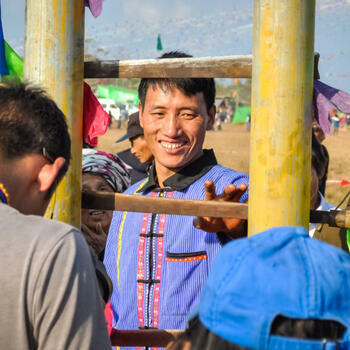 Rising to a height of nearly ten meters and steadied by guy-wires draped in colorful flags, the ladder of 36 machetes represents a challenge only open to Lisu men. Those wishing to prove their masculinity or attract eligible women are invited to climb. The step-ladder's rungs are made up of machetes sharpened to fine edges and pointing up. Men earn more respect the higher they climb, with those reaching the tiny platform at the top able to boast about their exploits for the next year. Another, far less dangerous way to prove one's manhood was by participating in crossbow-shooting competitions. 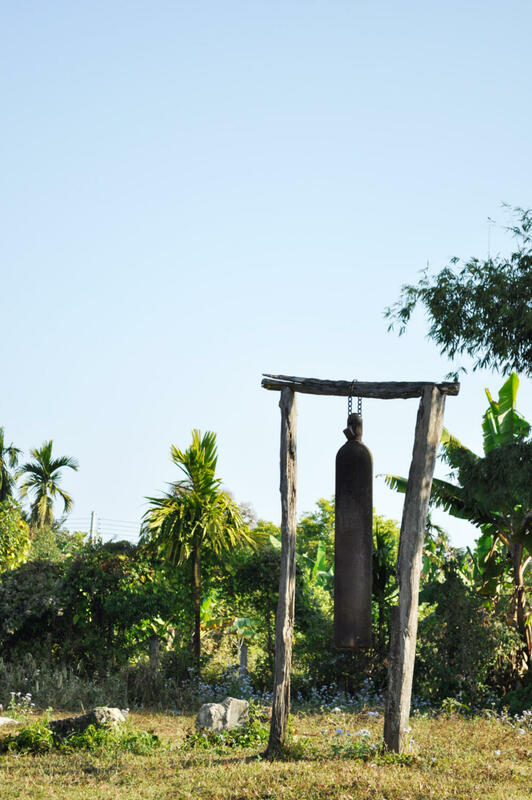 The crossbow is not only a traditional tool used by the Lisu in hunting game in the forest, but has also become a symbol representing their entire culture — thus the huge statue erected at the fairground entrance. 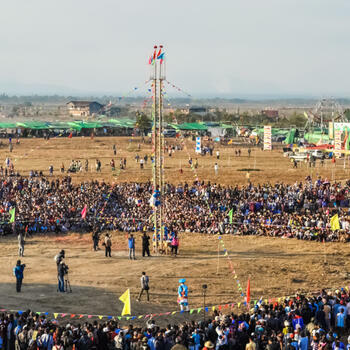 Beyond feats of bravery and skill, the assemblage of people gathered for Kuoshi Festival enjoyed meeting others from far away and taking part in the myriad games and performances going on around the grounds. 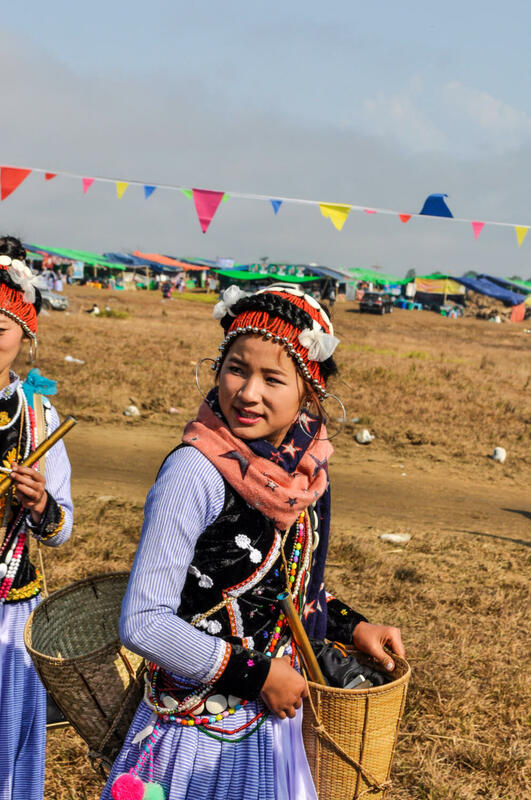 Food stalls serving local dishes were everywhere, as were booths featuring other hallmarks of Lisu life — rattan supplies for creating bridges and zip lines for crossing river gorges, traditional clothing, everyday tools and mountain medicinals gathered from the jungle. People gathered in these areas in droves, and the impromptu market lasted far longer than did the festival itself. Exhausted but elated after the festival, our group set out once again, this time to visit other Lisu villages tucked away in the hills surrounding Putao. 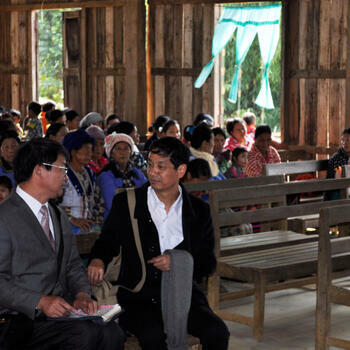 Wherever we went, all of the villagers, young and old, gathered at the local church to meet us. We gave them updates from the Nujiang Valley back in China. We also handed out quilts, clothing and candy, as well as money to help support their churches and assist poor parishioners. The villages we visited do not have any electricity, and someone owning a vehicle is rare. 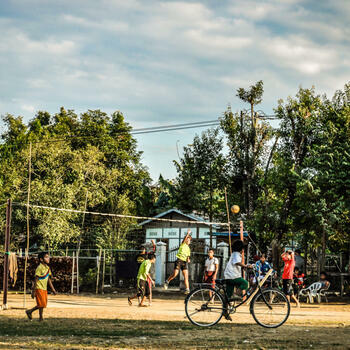 Despite these limitations, in each of the three places we visited, the kids played happily outside while their mothers and aunts prepared modest but delicious meals for us. For someone who has spent much of his life in the cities of China, the scenes to me seemed almost idyllic in comparison. Soon it was time to leave, and we headed back to Myitkyina. We had one more piece of business to attend to. 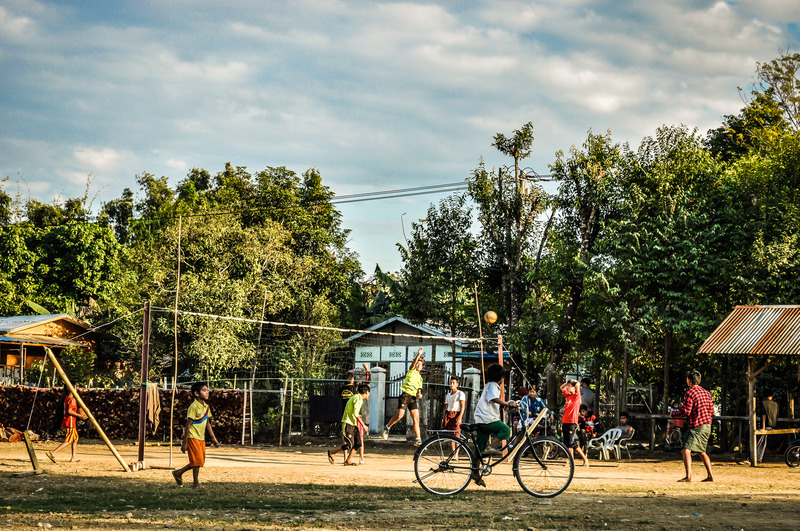 Once we made it back, we stopped at the Loving Orphan Center, an institution housing more than 230 students from across Myanmar ranging in age from five to 18 years in age. There and at a nearby cultural learning center on the banks of the Irrawaddy, we distributed the last of the 2,400 quilts and 160,000 yuan in cash we had raised back in China. For us, it had been the trip of a lifetime, one to cherish as a dream come true. We sincerely hope all those we visited with took as much pleasure from the experience as we did. 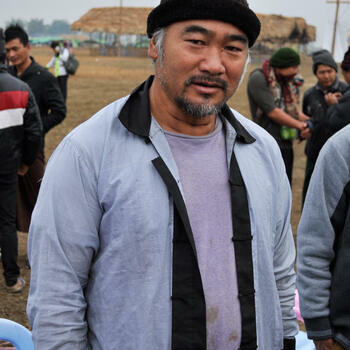 Author's note: Author and anthropologist Sun Fei is an avid traveler and has spent an enormous amount of time exploring the far reaches of northwest Yunnan. He also works with boutique travel company Delta Tours, where he guides cultural and historical journeys throughout the province. Superb reporting of an amazing trip. 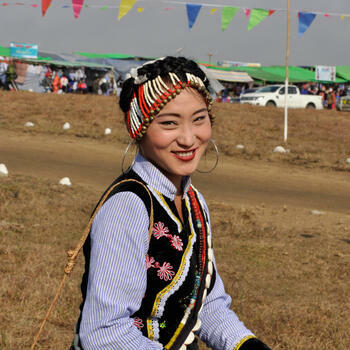 Thanks Sun Fri and GoKunming for bringing an exclusive look into Lisu culture across the border. Edit Sun Fri = Sun Fei. 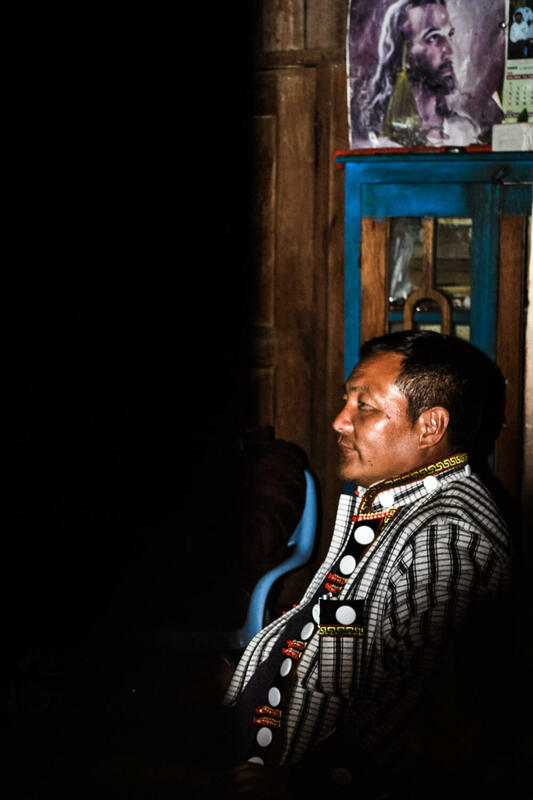 Anybody interested in the Lisu in Myanmar might like to take a look at Gertrude Morse's book, "The Dogs Bark but the Caravan Moves On"; and Eugene Morse's "Exodus to a Hidden Valley" - explains how the Lisu got there. 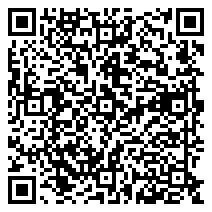 Written by 2 members of an amazing Protestant missionary family.